Hot Water Beach is reputed to be one of the world's top ten beaches. 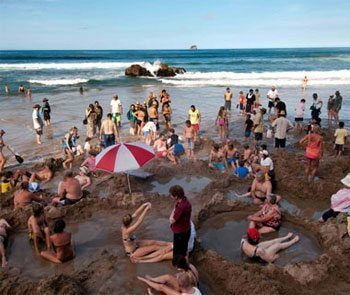 It has surf, virginal sand, beautiful native forest coming right down to the rocks and sand... and how many beaches in the world can you dig your own "spa pool" with mineral waters? It's so refreshing to be sitting in one, and having the tide come in and 'top it up' albeit with cool seawater. All times of the year. The beach is busier in the summer (around Christmas) and spectacular with the scarlet pohutukawa blossom dropping red petals onto the sand. But at midwinter, it's stunning, the bush (native forest) is cool and sweet-smelling, there's wildlife aplenty, and there's fewer people about. A bus comes daily from Whitianga to Hot Water Beach, plus Kiwi Experience (look them up on the net) call here too. It's safe hitchhiking around NZ, too. The hot mineral springs on the beach. Build yourself a spa in the sand and relax. A wide variety of accommodation here - at Hot Water Beach there's the luxury B&B (hotwaterbedandbreakfast.co.nz ), as well as budget accommodations and a beautiful camping ground right beside the lagoon where you can wake up to native birds' calls. There are great restaurants in Whitianga. Sunrises, sunsets, but if you want culture, head to Whitianga - about 40 minutes' drive away. Great range of shops, cafes, etc. in Whitianga. $New Zealand - we have EFTPOS cards (debit cards) in 90% of the businesses, so that makes trading easy. We all speak English - and understand foreigners, so it's easy to get around. New Zealand is one of the safest countries in the world - there are no dangerous animals here. You can walk quite freely in the bush (native forest). The worst enemy is often ourselves - when we don't think - like going off into the bush and not telling people where we're going. NZ's climate can go through four seasons in a daytime - especially in the South Island - so some people don't go out into the bush prepared for every contingency.